Description: Islamic Nursery Rhymes is an endearing collection of nursery rhymes for young children to learn about the beautiful ways of Islam in a lovely experience of singing with their parents and elders. The rhymes in the book are traditional nursery rhymes reworded with timeless Islamic meaning. For example, ‘Oranges and Lemons’ is an historical rhyme about ringing the bells of East London churches as a man made his journey to his execution – and the version here, entitled ‘Assalam Alaykum’, is about mosques in East London spreading salaam (peace) and news of prayer time. The illustrations by Fatimah De Vaux Davies are attractive and highly detailed (yet faceless) to delight children and engage their interest in the actions of practicing Muslims. For example, one illustration depicts Muslims gathering around a large Qur’an that is spilling out light. In another, Muslims are performing ritual prayers upon the earth, while boats sail, and airplanes and rockets fly. These beautiful Islamic nursery rhymes can be used as songful remembrance of Allah as a resource for developing pre-recitation skills before reading the Qur'an. As Muslims, instilling an Islamic foundation to our children would be the sixth reason why we would want to teach them Lymer's rhymers. They are indeed a good way to teach Islam to youngsters in my opinion. My son loves sounds and I don't let him listen to regular rhymes with instruments so this collection is truly a blessing. He gets excited and jams to it. Alhamdullilah for an halal alternative. I also like the fact that each nursery rhyme in the paperback indicates which traditional children song to rhyme it to. But if you want to buy the the actual MP3 songs to know how the author actually made it work, you can purchase yours on Google Play, Spotify, iTunes, Amazon, and/or many other places where tunes are sold. I definitely recommend it to Muslim mothers. 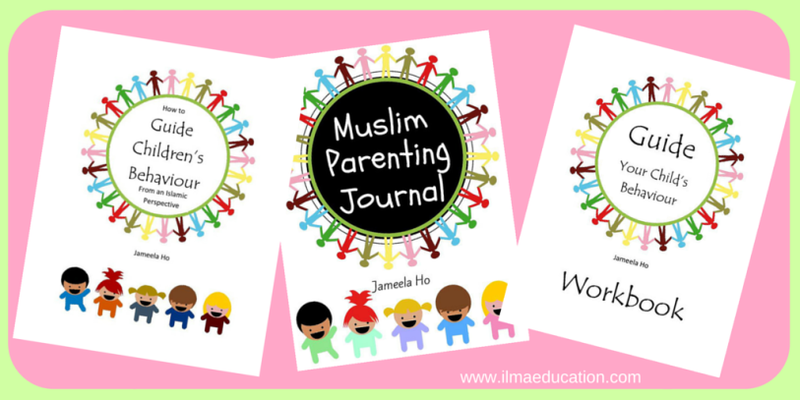 I received three free PDFs to review from Author Jameela Ho for my honest opinion. And the verdict is that this collection is a compelling parenting guide. Because I’m also a Love and Relationship Adviser, I think the methods laid out by sister Jameela Ho can also be applied to our marriages insha’Allah. I started my review backward. By that, I mean I started reading the workbook first. Then, I read the Muslim Parenting Journal. And finally, I read the actual book. Normally, people read these the other way around. It doesn’t matter to me. What matters is that this method worked for me and I was able to get the benefits of the knowledge she passed down to me alhamdullilah. So the Workbook is about 27 pages and it will give you many tips before you resort to corporal punishment if must go there as a parent. The Journal is about 42 pages. It includes plenty of space for you to write down the way you will implement your parenting skills after it gives you hadiths sherif, quotes or proverbs for each of the 19 strategies of better parenting. This is also a great writing prompt for parents to reflect on past and future actions. Below is the summary of the 19 techniques for better parenting. Finally, the actual book ‘How To Guide Children’s Behavior (From an Islamic Perspective)’ of about 37 pages goes deeper and coaches us on how to act and say things to our children. It makes us realize that it’s not what we say that have an impact on our children. It’s how and the way we say it. I definitely recommend it to any parent who needs a fresh start with challenging children. Originally published at www.aductrinormom.wordpress or Hayatimagazine.com . It is my pleasure to interview today Papatia Feauxzar from Djarabi Kitabs. She is a wife, a mother, a homeschooler, and a busy entrepreneur who is mostly known for her passion in writing novels. Let’s find out more about her, her homeschooling journey, what motivated her to start, and how she manages everything. Oum Soumayyah: As-Salaam ‘alaikum wa-rahmatullah wa-barakatuh sister Papatia. How are you doing today? Papatia Feauxzar: Wa aleikum salam waramatulahi wa barakatu Oum Soumayyah. Thank you for inviting me and interviewing me. It’s truly an honor, masha’Allah, I’m doing good. Alhamdullilah. How are you? O.S. : Alhamdulillah, I’m doing great. Jazak Allahu khayr for asking. Would you please tell us a little bit about yourself? P.F. : Sure! Papatia Feauxzar is a lot of things. She’s in her early thirties and gives thanks for living to this age. She’s also a mother to a crazy little boy of 17 months and she’s been married for almost five years masha’Allah. Alhamdullilah. She’s originally from French West Africa and has been living in the USA since the years 2000. O.S. : Maa shaa Allah! Allahumma baarik. How long have you been homeschooling your little one, and what made you decide to start despite being an entrepreneur? Is there anything in particular that motivated you to do so? P.F. : I started homeschooling mid November 2015 alhamdullilah. It was shortly after the Paris attacks. Many things played a role in my decision. I was ready to pursue my passion for writing and the state of Muslims started to make me feel a little uncomfortable outside the home. My gut feeling kept telling me that it was time for me to make my exit and I did. It had always been a struggle to keep or leave my job with a baby entering the picture. I wanted more time with the baby so I didn’t blink twice when things felt right for me to let go of working outside the home. Finally, I was starting to be burnt out from juggling so many roles; mother, wife, accountant, writer, etc. O.S. : I understand. Subhanallah. How did you start your homeschooling journey, and what method do you use? P.F. : I did plenty of research online and I read books about parenting from an Islamic perspective. Pinterest also came in very handy. My son and I do many activities appropriate for his age. I also try to take him out to playgrounds so that he can get the interaction he needs with other children. Every child is so different so I don’t get too caught up on only one method. I try to use anything relevant I come across and add my own touch because I know my child better; what will work and what won’t work with him. O.S. : I keep on seeing Pinterest around, but I’ve never actually looked much into it. It must have lots of interesting information. What were the responses of those around you when you decided that being homeschooled would be your son’s method of learning in shaa Allah? Any support or discouragements? P.F. : I haven’t come anyone who voiced a disagreement so far. Ultimately, we all know that any mother who has the mother’s instinct would prefer to look after her children for love and safety reasons. A lot of working mothers I know wish they could work from home too and look after their children. That said, it’s not easy to work from home and raise a child. But it’s a challenge I gladly accept alhamdullilah. O.S. : Alhamdulillah. Did you face any challenges or surprises along the way? O.S. : They sure do! But that’s what also makes them adorable, maa shaa Allah. Multitasking definitely becomes necessary with motherhood. I’m still working on that. In relation to being home educated, how has the reaction of your son been so far? P.F. : Everyday, I set times where I give him undivided attention. That helps us connect alhamdullilah. Getting him to take a nap mid-day was hard at first but I stuck with it and now anywhere between 11 and 3pm, I have a little to myself to be more productive when he’s asleep. O.S. : Now I must ask; how do you manage homeschooling with your passion for writing, and having another job from home? What’s your planning secret, and do you ever get overwhelmed? P.F. : Yes, I do get overwhelmed because I’m only human. My secret is dua haha! I constantly invoke Allah’s name so that HE helps me achieve my goals and become productive. O.S. : Du’a is without doubt the perfect toll. In your opinion, what are the pros and cons of homeschooling? And do you plan on continuing homeschooling your child till adulthood? P.F. : For pros: You get all the time you can never buy with your child. It’s a great learning experience with a lot of curve balls that are beneficial in the long run. It’s simply rewarding. For cons: It’s VERY demanding and can take a toll on mothers and marital relationships. Yes, until he gets his high school diploma and the college folks will take it from there insha’Allah. O.S. : Till High School? Perfect, maa shaa Allah! May Allah make your journey successful! Would you recommend homeschooling to any parent? P.F. : Insha’Allah until high school :). Amiin! And yes, I would recommend homeschooling to any parent because education starts at home. A working mother who quits like me can always go back to work after spending time at home with the baby for the first years of her child’s life if she wishes to. Having said that, money is a necessity and many working mothers don’t have the luxury to stay home and instill that education themselves and they shouldn’t be put to shame for that. O.S. : Right, not every mother has that luxury. And I agree that education does start from home. But when it comes to a systematic way of educating a child throughout his/her life, it’s not always an easy task, and many parents doubt their ability to do so even when they want to. So do you have any advice for parents out there who would love to homeschool their children, but are afraid of where and how to start, or worried about failing? P.F. : Yes, I do. I recommend that they look into blogging, Facebook parenting groups for support, and check out online resources such as Pinterest. They have great sources masha’Allah. I’m also part of an online group called Muslimah Bloggers and there are a lot of mothers sharing their homeschooling adventures there which can benefit any newbie insha’Allah. O.S. : Jazak Allahu khayr sister Papatia for being kind and allowing me to interview you. It was an absolute pleasure to talk to you, and I’m sure your tips and resources shared could benefit a potential homeschooling parent out there in shaa Allah. Have a wonderful day sister. As-salaam ‘alaikum wa-rahmatullah wa-barakatuh. P.F. : Wa iyyakum my dear sister. The pleasure was all mine masha’Allah and Jazakh’Allah khair for the opportunity. I hope my tips help many insha’Allah. Have a wonderful day too and wa aleikum salam waramatulahi wabarakatuhu! O.S. : This was an interview with our dear sister Papatia Feauxzar. I really enjoyed interviewing her and hope you enjoyed reading as well. If you’re planning on homeschooling, but are worried about your ability to do so, start by looking into the resources and tips that she provided. It’s all about taking baby steps. Plan, but don’t think too much ahead of yourself in order to avoid being overwhelmed. And don’t forget, du’a, du’a, du’a! Just make du’a to Allah and do your part. You can do it! In shaa Allah. May Allah make it easy for you and grant you success.